Once you've tried it, you won't forget it. I had my first focaccia di Recco at Manuelina, in Recco. Ever since, I wished to have the chance to eat this delicacy back home, in Singapore, but I just couldn't get hold of the cheese. Leaving aside the fact that in Recco they use a special cheese called prescinseua, which would be completely impossible to find in Singapore, you can obtain superb results with crescenza or stracchino. I made an order of crescenza from Giorgio Ferrari, and 2 weeks later I finally got it. And here I am, now making the so awaited Focaccia di Recco. I must say that it came out as good as I remembered it, and although it came close to Manuelina, it was definitely miles better than the one I had at "Pizzeria al Ponte" in Recco. Stir water, olive oil and salt, then gradually incorporate the flour. Knead for 5 minutes or until smooth, then divide into 4 round balls (this will make 2 focaccias for the first round) and wrap them tightly into cling film. Set aside for 2 to 3 hours at room temperature, or 2 hours in the fridge and one out at room temperature. Now the dough is ready for stretching. 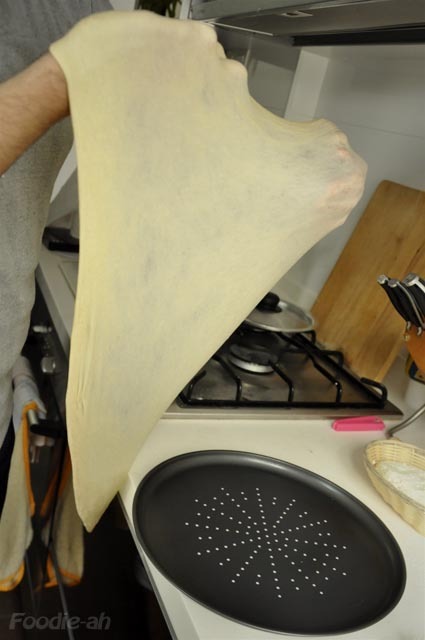 Remove the cling film, pat some flour around the dough and flatten it by pushing it with your fingers, until you obtain a flat "pizza" like shape. Do not stretch it or pull it at this point. 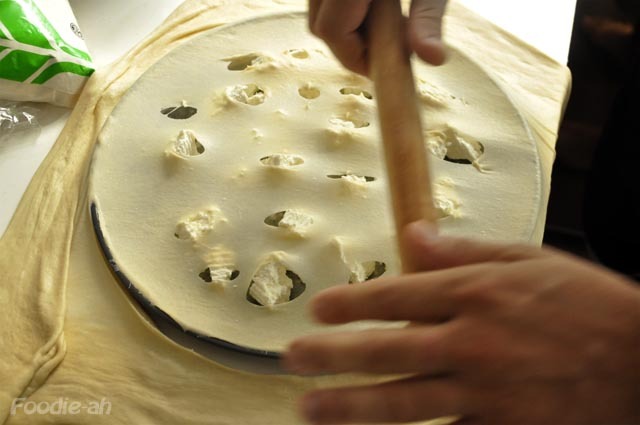 Now lift the dough, and let it stretch naturally with its own weight, supporting it with your fists (like in the picture above). Keep stretching it, until you lave a large section in the middle that is paper-thin and transparent. Now the sheet is ready for laying on the tray. I used a non-stick pizza tray I bought in Cold Storage. Slowly fit it onto the tray, then cut the crescenza cheese into small pieces and scatter them around the perimeter and in the middle. I used about 100gr of crescenza for each focaccia. Repeat the same stretching exercise on a second piece of dough, then lay it on top of the other, and make the two stick around the edges. 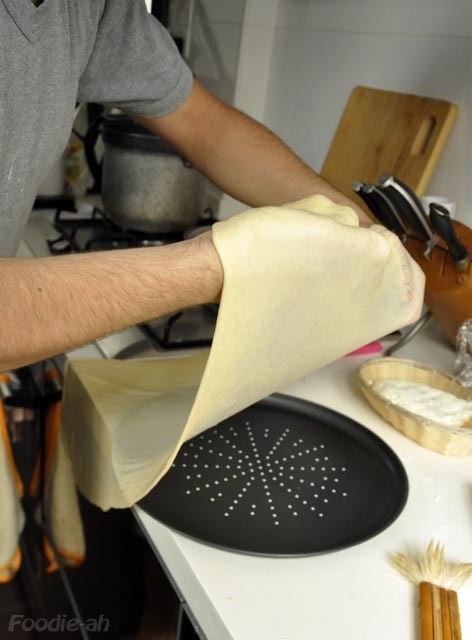 Pinch the upper layer with your hands, making holes more or less where you placed the cheese, to allow the trapped air to escape during the baking process. Finally, with the help of a rolling pin, cut the focaccia around the edges, and recollect the residual dough into a ball. 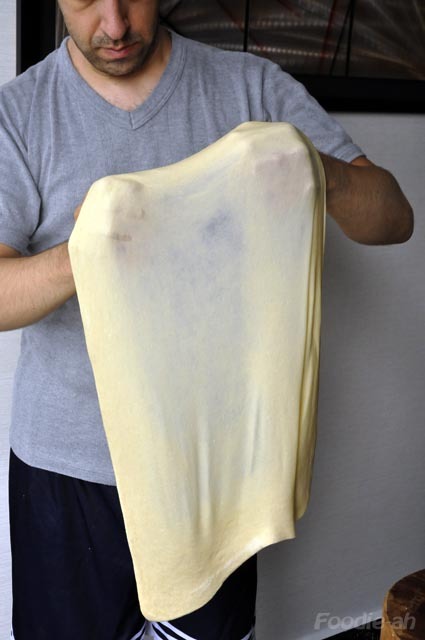 It can be reused after resting for 2-3 hours in cling film to prevent it from drying out. Drizzle with a cap of extra vergine olive oil and some freshly ground black pepper, and it's ready to bake. 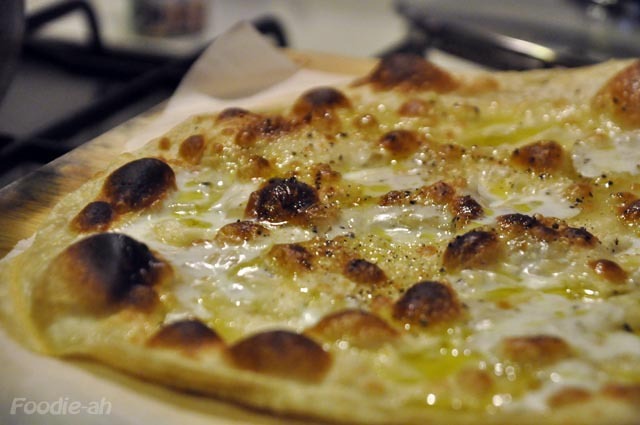 The focaccia will need to cook in a very hot oven (250C and above), on a hot stone that you will have placed far in advance to ensure maximum heat from below and a perfect crispy base. I used a Ferrari Pizza Oven which gives perfect results. I must say the 2 weeks wait for the crescenza was well worth waiting for!